Synopsis: The loveable, magical nanny returns, but this time she’s out for blood and break dancing. Memorable Scene: A 35-minute dance off between Zombie Poppins and the Haitian dance crew. Every sick move in the book is presented. Then Vanilla Ice makes a cameo but Zombie Poppins rips his head off mid rap. She then proceeds to eat his brain in front of the audience. Plot: Things go terribly wrong when Marry Poppins’ is a little tipsy on a late night umbrella ride and on her way down she gets tangled in some electrical wires and before you can say supercalifragilisticexpialidocious she sends London into a blackout and herself to the morgue. Thousands of children mourn Mary Poppins, as her body was laid to rest, but two of her favorite children are noticeably shaken by the news. On a sudden whim the children decide to swipe Mary’s secret diary at the funeral, which is resting in her lifeless hands. This way they can remember her always. One year later, on the anniversary of her death, the two children go to her gravesite and recite what they think is poem from her diary. After each progressive line flows from their mouths the sky grows darker and the ground begins to shake. Soon Mary Poppins’ grave begins to split and her poorly decayed body slithers from beneath the dirt. The children try to flee before zombie Poppins notices their presence, but she’s already caught their innocent smell. It seems like Mary Poppins was more then a nanny, she was a full-fledged witch, and now she’s a bloodthirsty zombie with a taste for brains. Mary catches up with the children down the road and enjoys her first undead meal. With the blood of the innocent on her newly risen hands Mary Poppins dishes out magical justice against the children who won’t listen to their parents… Broccoli haters, kite flyers, girls who wear skirts above the knee, all will pay for their crimes. Word spreads quickly of the horror’s being caused by zombie Poppins. Even the police are powerless to stop her. It isn’t until zombie Poppins ventures down to mean streets of London’s East Side that she meets her match. 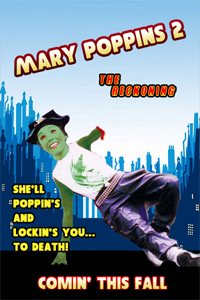 When the Haitian break-dance crew from the East Side hears about zombie Poppins they know the perfect way to stop her. They grew up in the land of the zombie. Haitian legend has it that the only way to beat a zombie is challenge them to dance a dance off. The complicated movements and scandalous gyrations should throw Poppins off her game. But the “Devil’s music” is what will send her straight back to Hell. The Haitian dance crew will meet zombie Poppins for a final show down on the gritty streets of London’s East Side. A break-dancing duel ensues… and finally ends as Mary Poppins and locks her shoulder out of place and sends her hand flying towards the kids. They finish the spell, avoid the projectile arm and banish Poppins to the netherworld. As they walk away triumphantly, no one seems to notice the arm is still present, and gets one last twitch before all fades to black.